It can’t be said that the media failed to mention it altogether, because The New York Times made passing reference to it on December 12 (Chemical Arms Used Repeatedly in Syria, U.N. Says).Other media outlets did too. They just didn’t give it much coverage. This is the same mission whose report on the August Ghouta incident is now widely misreported in the Western media to have strongly suggested that the Syrian army was responsible for the gassing deaths of hundreds. In fact, while the UN report concluded that a chemical weapons attack had occurred, it did not assign blame for the attack, and noted that physical evidence at the site had been manipulated, complicating whatever inferences one cared to make about who the perpetrators were. 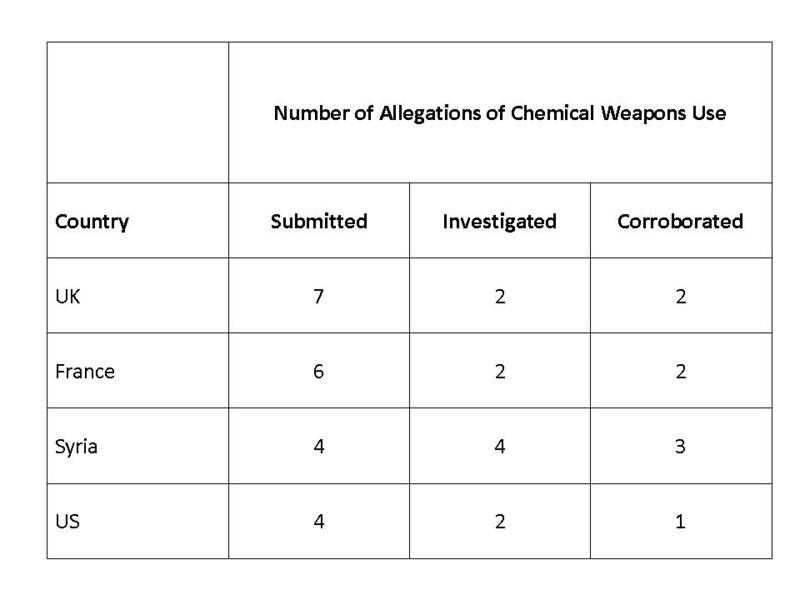 The mission’s final report—presented to the UN Secretary General on December 12 – explores a number of other incidents in which chemical weapons were allegedly used. The inspectors corroborated three of four Syrian government allegations that its troops had been gassed. In one of the alleged incidents (on March 19 at Khan Al Asal) civilians were also gassed. That incident “reportedly resulted in the deaths of 25 people and injured more than 110 civilians and soldiers,” according to the UN report. Given that Syrian soldiers were the targets of these attacks, it seems very likely that insurgent forces were responsible. Of course, that’s by no means certain. It’s possible that the soldiers were exposed to sarin after mishandling their own weapons. But the balance of probabilities favors the view that the insurgents were the culpable party. Had UN inspectors concluded that chemical weapons were used against insurgents and civilians, killing two dozen and injuring over 100, it is nearly certain that this would be the top news story in Western media for days to come. However, given that the report points, instead, to the insurgents using chemical weapons, and not Syrian forces, it has been given little play. The New York Times limits to three paragraphs its reporting on those elements of the UN report that point strongly to the culpability of insurgent forces, and reporters Somini Sengupta and Rick Gladstone take pains to minimize the mission’s findings, noting that “verification was impossible” and that in the Jobar and Ashrafiah cases “the report said, chemical weapons may have been used on ‘a relatively small scale against soldiers’” (emphasis added). In fact, the relevant conclusions from the report, reproduced below, evince more certainty than Sengupta’s and Gladstone’s use of “may” acknowledges. 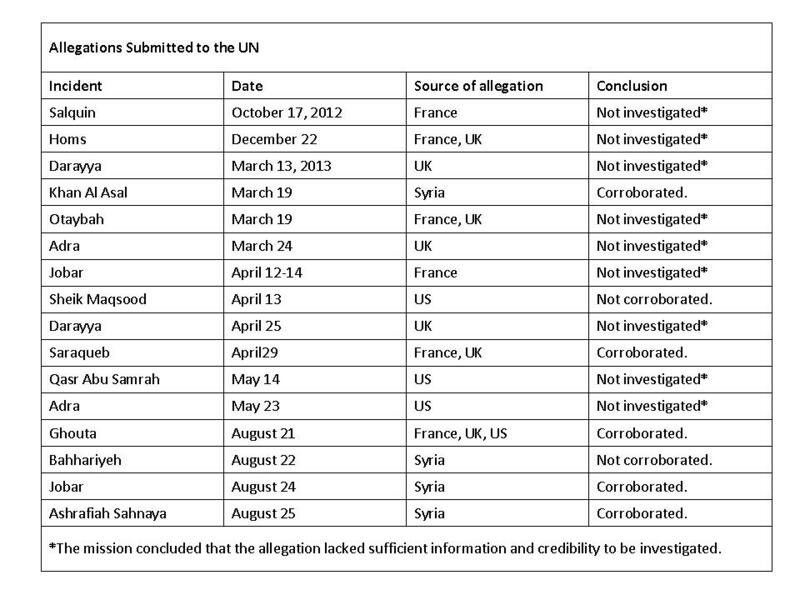 Interestingly, the report reveals that the UN team felt that most of the French, British and US allegations against Syria lacked sufficient information and credibility, and so were never investigated. On the other hand, the mission found all four of Syria’s allegations to be sufficiently credible to investigate, and corroborated three of them. This suggests that in most instances, the allegations made by the Western powers were propaganda-driven, and were intended to manipulate public opinion through the innuendo effect—the tendency of people to regard allegations as fact, especially if viewed to come from a credible source. The UN mission, however, had other ideas about how credible these sources were. On the other hand, Hersh revealed that Washington had no evidence that the Syrian army was responsible for the August 21 Ghouta attack. The New Yorker and Washington Post, which usually run Hersh’s investigative reporting, refused to publish his story. With the UN report offering credible evidence that the insurgents have used chemical weapons, it’s difficult to attribute the media outlets’ rejection of the Hersh story to concerns about the credibility of Hersh’s reporting. It’s more likely that they, along with media outlets who are underplaying the UN report, are trying not to draw too much attention to the use of chemical weapons by insurgents.